ConceptDraw DIAGRAM is a powerful tool that helps you produce diagrams using software. Fine-tuning the objects in ConceptDraw DIAGRAM allows you to create a really professional finished article. ConceptDraw Arrows10 Technology gives drawing connectors a smart behavior that gives you freedom and flexibility, and a bit of magic to your results. Sample 1. EPC diagram - Login and registration processing. Use the Basic Diagramming Solution from the Universal Diagramming area of ConceptDraw Solution Park to easy create simple forms, questionnaires, survey forms, registration and application forms, etc. When planning to create a neat presentation out of lot of data, try mind mapping. It is handy, especially when you want to represent pictures and text on the same page. With the Presentation Exchange solution you can easily extract the content from a PowerPoint presentation to see how it all fits together in a single view. You can review slide content, see how the slides support one another, and refine the story. You need create a Sales Process Map? 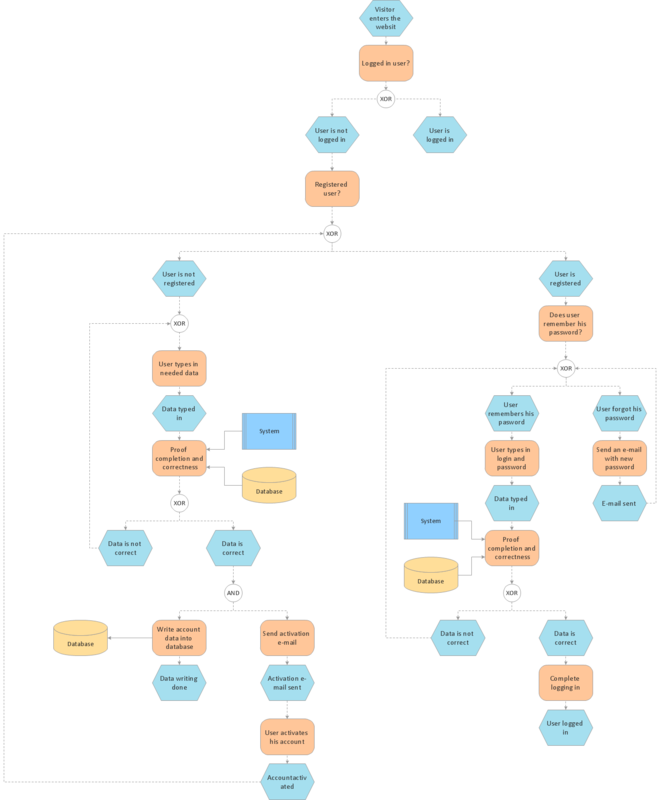 Use the ConceptDraw DIAGRAM v12 software which is ideal for the sales process management, marketing and engineering thanks to the powerful Sales Flowcharts solution from the Marketing area of ConceptDraw Solution Park.